Life can be hard sometimes — early mornings, long rides on the commuter bus, or that Chuck E. Cheese birthday party that your daughter was invited to — and you find yourself wishing that you could escape to the same wondrous place that the woman on the Ghirardelli commercial appears to be going to when she bites into her way-too-small piece of chocolate. You can. Go there, that is. And, with almost as little work as it takes to unwrap a chocolate square. One part creamy chocolate truffle and one part gooey dulce de leche — Brazilian brigadeiros are borderline irresistible. My lovely friend (and fellow food scholar) Amanda introduced me to these two-bite treats more than a year ago and I think I may have eaten my weight in brigadeiros since then! Rolled in coconut, spiced with fragrant Ceylon cinnamon, or studded with crispy chocolate bits — each variation on the basic brigadeiro is wonderfully unique and delicious. Much like the coconut chutney from the dosa cart in Washington Square Park or the guajillo-braised short rib tacos at el Luchador, brigadeiros quickly landed themselves on my “can’t-die-happy-unless-I-learn-to-make-this-recipe” list. 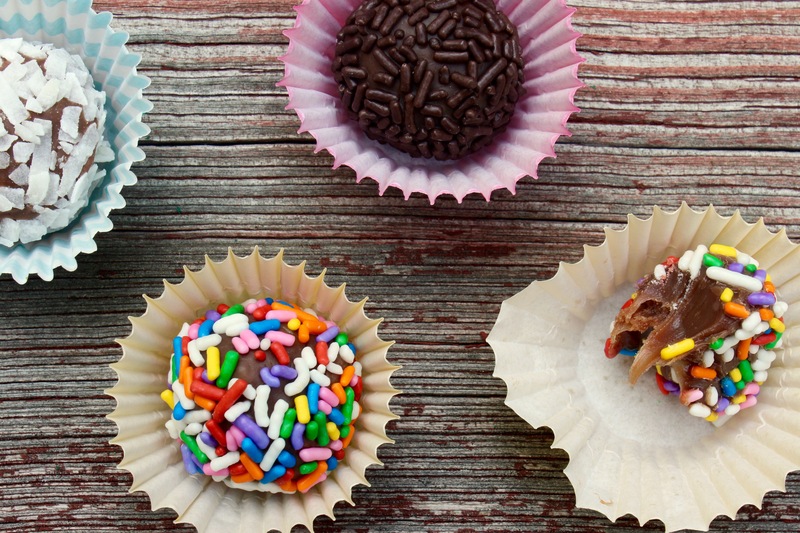 Fortunately, Amanda not only knows where to find brigadeiros in the city, she knows how to make them too. She tells me that in Brazil, brigadeiros are made with a special, sweetened, chocolate powder— something that we have yet to find in this gastronomic wonderland called New York City. So, our recipe uses miniature semi-sweet chocolate chips instead; they’re easy to find and I like that they aren’t overly sweet. 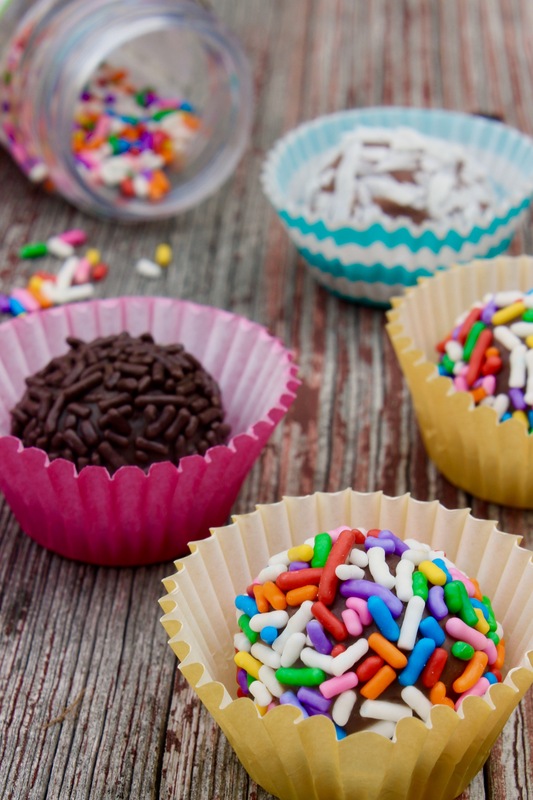 Brigadeiros are often covered in sprinkles (probably because they’re a popular treat at children’s birthday parties) but other yummy coatings include shredded coconut, sanding sugar, ground nuts, and small chocolate pieces. Regardless of how you make your brigadeiros (whether you follow this recipe exactly or use it as a starting point to create your own flavor) you’ll find that they’re wonderfully easy to make — and, that their ooey, gooey goodness has a way of making all the other crazy things in your life, disappear! Rub a thin layer of butter into the bottom and sides of a wide, heatproof dish. Set the dish aside. Put the sweetened condensed milk and chocolate chips into a medium pot. Cook the sweetened condensed milk over medium-high heat, stirring constantly, until the chocolate chips are fully melted and the mixture begins to thicken. Test the mixture for doneness by drawing a line in the mixture with a spoon. If the line fills itself in quickly, keep cooking. If the line fills itself in slowly, pour the mixture into the buttered dish. Let the brigadeiro mixture stand until it is cool enough to handle, about 1 hour. Rub butter onto your hands and fingers so that the brigadeiro mixture won’t stick. Then, roll a small amount of the mixture into a ball before coating it in sprinkles. 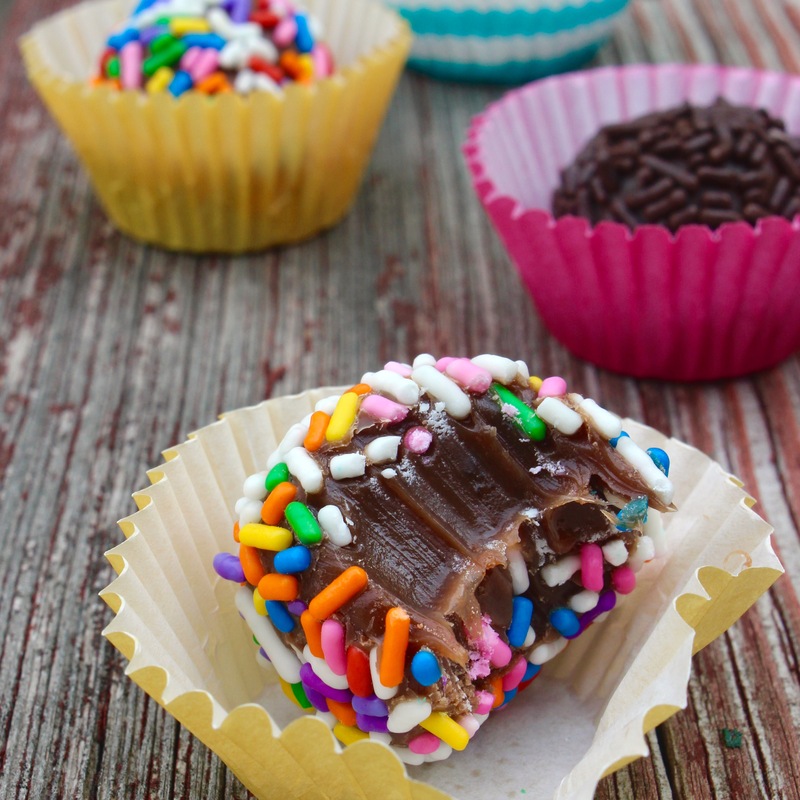 You can also roll the brigadeiros into shredded coconut, seeds, chopped nuts, or small pieces of chocolate. Store the brigadeiros in the refrigerator. Let them stand for 15-30 minutes at room temperature before serving. These look YUM. And a fun project for a group, too. Yes! Food is always better with friends! 🙂 Aubrey had a blast making (and photographing) her own little batch!